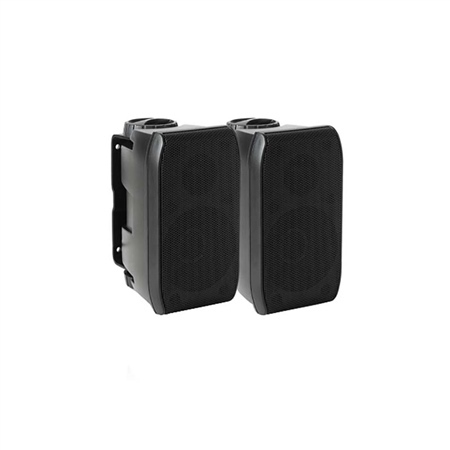 The MS-BX3020 Signature Series Cabin Speakers represent the highest quality purpose-built marine cabin speakers from FUSION, which are carefully designed for the marine environment whilst maintaining superb sound quality. The FUSION MS-BX3020 features a 3" mid speaker, with a waterproof paper cone and a fluid cooled fabric dome tweeter and are constructed with a magnet system to produce high efficiency from a small box. For those who enjoy the finer things in life, the MS-BX3020 Signature Series Cabin speakers are in a class of their own. For the best possible acoustic experience, FUSION recommends pairing the MS-BX3020 with the MS-AB206 Signature Series Active Subwoofer. The Class-D amplifier input is tuned specifically for the MS-BX3020 speakers, creating a truly unbeatable home theatre experience on the water. Compact optimized acoustic chamber – Acoustically optimized to deliver home theatre-quality entertainment in your home away from home, the internally shaped acoustic chamber reduces reflective effects for superb sound quality. Sophisticated internal crossover network – The MS-BX3020 speakers feature a sophisticated internal crossover network and high-quality cone construction with added low-frequency protection to avoid damage. Waterproof paper cone – Features a waterproof paper cone for high efficiency and the best presentation of sound, making the MS-BX3020 perfect for the marine cabin environment. Fabric Dome Tweeters – The magnetic fluid-cooled fabric dome tweeter includes resonance control to consistently produce premium, clear audio in the cabin environment. Installation Kit Included – Everything needed to connect your MS-BX3020 speakers is included in the box. These Signature Series Cabin Speakers are covered by a True-Marine™ 3-year limited consumer warranty for indoor installation.